Back in college I used to get acrylics, but it eventually became too costly to keep up the cost. Near the end of that experience, nail companies began to come out with the gel polish and I switched to that - cheaper, healthier, and lasted longer. Much like the acrylics though it became a cost that I had to cut out. I loved having my nails done though so I would paint them myself, but unfortunately they would chip within a day or two and I'm just too lazy to keep up with it. I mean, the last time I had my nails professionally done (gel polish) was for my wedding and I allowed it to hang on much longer than I should have. Another problem I have with painting my nails is the waiting for them to dry! When I used to get acrylics, the woman would make me wait at least ten minutes before I left because more often than not I would come right back in because I messed something up! 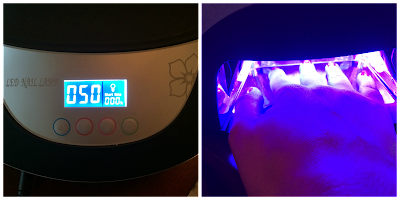 But that's where the Ivation Professional Manicure Curing/Setting Lamp comes into play! This thing is amazing! Due to Amazon Prime I ordered this Wednesday night and it arrived Friday afternoon! As soon as I had everything unpacked from the day and taken care, I pulled this thing out to play! At first I thought this was battery operated and I got a little annoyed, but it turned out the plug was just hidden inside the packaging. The directions we're . . . pretty non-exisant so I had to do some research to figure out how long I needed to keep my hand in the machine. Especially since this particular model can be set at five second intervals between 5 seconds and 15 minutes, which is excessive. I looked up a few websites, and my own experience with these kind of lamps, I figured anywhere between 30 seconds to one minute would be ideal and according to varies websites the time will vary based on polish color and brand. My first go-round I attempted 30 seconds, but the polish was still a bit tacky and wet. For the second coat I tried 50 seconds and that worked pretty well. For my second hand I did a coat of polish, 50 seconds, a coat of polish, 50 seconds, top coat, 50 seconds. The polish was 95% dry, so next time I might go up to one minute. Some of the reviews on the Amazon page state that it was too small for their hands, but I didn't really see this to be a problem for me. I can see that if you had long fingers / big hands / longer fingernails that you would have some problem getting your hand in there, but that'd be easily fixed by doing your thumbs together, but separate from your fingers. One of the huge pluses to this machine is that I used my regular nail polish. I didn't have to go out and buy special gel or shellac polish, but got to use all the nail polish I already own! I was a little nervous that this wasn't going to be the case and I'm so thrilled that it's not. It is a bit of money, but from what I've researched it's is pretty on par with similar products. Plus if you order is on Amazon you're automatically saving $30. 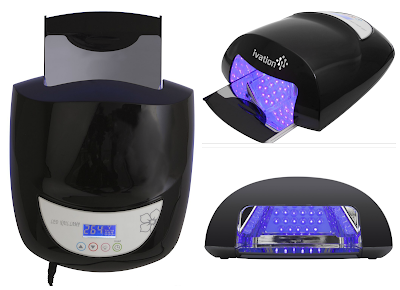 So if you enjoying doing / having your nails done but, like me, hate waiting the half hour plus for the polish to dry you'll definitely want to purchase the Ivation Professional Manicure Curing/Setting Lamp. I received a free sample of the product for evaluation purposes. All thought and opinions are my own.